Wedding Portraits from Photographs with No-Risk Guarantee! 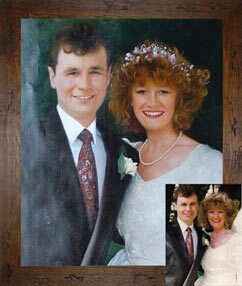 "Own a unique oil painting of Your 'Big Day', created by a specialised artist from your own favourite photograph!" One of our team of specialised artists will create the finest quality, exclusive, hand-painted oil painting from your own favourite wedding photograph, on fine quality European linen canvas. A beautiful gift for the wedding couple as a magnificent reminder of their special day, or an equally treasured gift for parents or grandparents. Your favourite wedding photograph can be recreated in vibrant oils in a wide range of sizes to suit your individual requirements and budget. Thank you very much for the beautiful painting... your artist has captured every detail....It is a real Treasure. We won't make any attempt to mislead you here. You'll obviously want the details of the bridal gown and all other accessories to look just right and this takes our artists a lot of time, so 'Wedding Portraits' are normally the most expensive part of our 'Paintings from Photographs' specialised service. Having said that, the only other way to capture that special day in vibrant oils on the best quality canvas would probably cost you thousands of pounds and mean enduring countless 'sittings' in an artist's studio. All of our oil paintings are created entirely by hand by very experienced artists, without automation of any kind. If you'd like to discover some more facts about our works of art, click here. * Full-length couple (except 12" x 16" - 'head-and-shoulders' couple only) in wedding attire on a plain background. 'Head-and-shoulders' and single subject portraits start at just £95 (US$143). See our 'Paintings from Photographs' general 'Price Guide' here. Price includes VAT in the UK and free delivery worldwide. US$ prices are approximate and depend on the exchange rate. Frame not included. An oil painting makes a very special, unique gift and imagine the joy of receiving a fine oil painting of loved ones. Why not transform your favourite wedding photograph into your very own work of art? A priceless gift to cherish forever! If you are not delighted with your unique oil painting for any reason, just send it back within 3 months (yes 3 months! ), for a no-hassle, no-questions-asked full refund! We believe we should take all of the risk, leaving our customers with absolutely none. That's more than a guarantee, that's my personal promise! If you are ordering as a gift for that special someone and you are not sure which photograph they would like transformed into their very own work of art, we can solve your problem. You can buy them a Filman Fine Art Gift Voucher here and let them choose for themselves! This makes a perfect gift to buy the married couple for a wedding present, as they can select their own favourite photograph to have transformed into their very own 'masterpiece' when they have a bit more time to decide for themselves. The 'Gift Vouchers' are redeemable any time up to a full 12 months after purchase, so there's no panic! Fill out the details of your requirements on our 'Order / Request Form'. You will receive an estimate of the cost by return email. Send us your photograph with a cheque/money order for half of the estimated price (or pay the full price by credit card if you prefer). The balance will not be due until you've received your work-of-art and you are delighted with the result of your order. We'll confirm the price by email when we've seen your photograph and, on your authorisation, we will assign your oil painting exclusively to one of our specialised artists. If you prefer, you can pay the full price at this point via our secure credit card facilities in pounds (£), US$ or euros. Order here NOW with complete satisfaction guaranteed and free delivery worldwide, then eagerly await the arrival of your very own beautiful, exclusive work of art. P.S. Click here to give us your feedback and get 10% off! Filman Enterprises Limited, registered in England, number 4778558.